We have text articles slowly loading multiple megabytes of tracking/ads/cryptomining rather than loading instantly with the information the user actually wanted. We have two major and incompatible versions of Angular in production. Front-ends are becoming replications of the entire backend which creates twice as many places for errors and slows down development considerably. JAMstack is a breath of sanity in the very cluttered and overcomplicated space of web development. 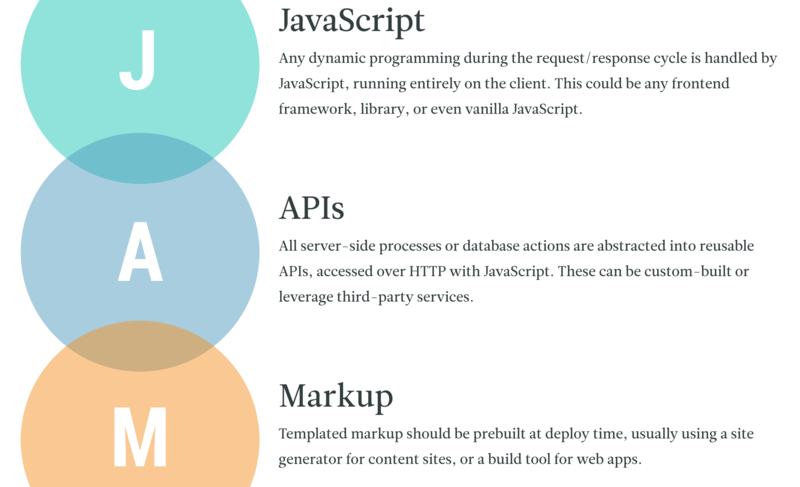 Working on the web can be faster and easier if we abstract out the most common features of web pages as APIs rather than reinventing the wheel each time with the hypest “language du jour” is. This site was built using JAMstack principles. Here’s how I did it: I used Hugo, Github, Forestry.io, Netlify, and GoDaddy(I have since moved to Namecheap). Now I can log into Forestry from anywhere and update my posts, add pictures, and change my pages around without having to work in the command line. It’s like having usability of Wordpress except it’s free to host, easier to scale, and way more secure since it doesn’t have a juicy login page to attack. JAMstack is obviously not suitable for every single website or project(I still build most of my applications in Ruby and Rails) however most business and informational websites would gain significant benefits from switching from something like Wordpress to a JAMstack build. This is definitely a paradigm that any serious web developer should have in their toolbox if they respect their users.